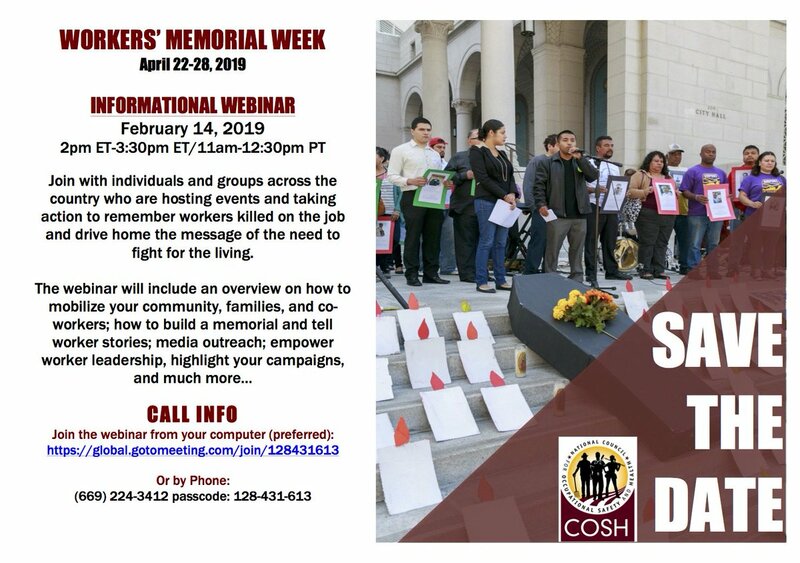 National Council for Occupational Safety and Health (National COSH) is holding an informational webinar on 14 February to start planning for International Workers’ Memorial Day. In the US a week long series of actions and events will commence on 22 April and build up to the nationally recognised day of 28 April. Join with individuals and groups across the country who are hosting events and taking action to remember workers killed on the job and drive home the message of the need to fight for the living. The webinar will include an overview on how to mobilise your community, families, and co-workers; how to build a memorial and tell worker stories; media outreach; empower worker leadership, highlight your campaigns, and much more. Watch out for news of a Spanish webinar!